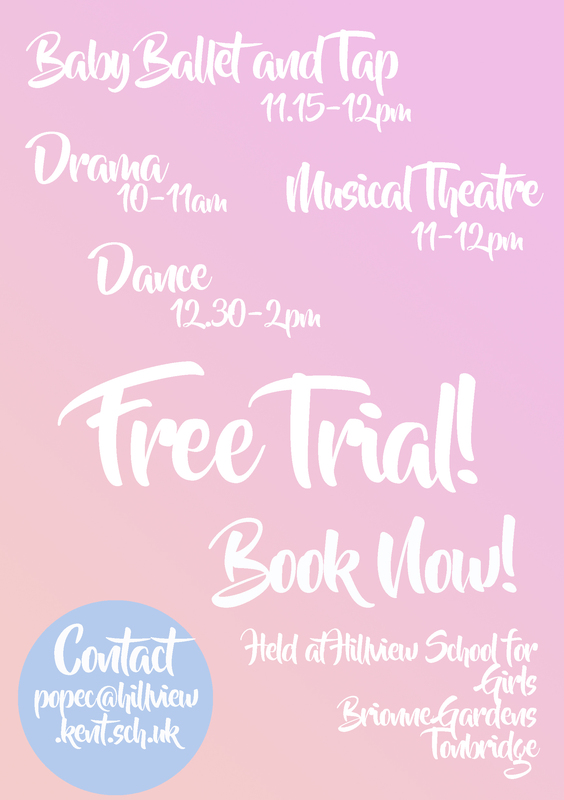 Welcome to Hillview Performing Arts Saturday School, we are open to boys and girls from the local area and surrounding Primary and Secondary Schools. 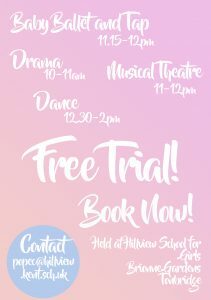 We offer fantastic classes in Drama, Dance, Musical Theatre as well as Baby Ballet/ Tap taught by specialist teachers in a relaxed environment without the pressure of a strict syllabus or exams. Our teachers have excellent training and ensure that the classes are fun and enjoyable. Our fees are very reasonable with classes averaging at just £4 a lesson with discounts applied when a student takes more than one class. Our fees are payable termly on the first lesson of each new term. If you would like to book your son/ daughter onto a trial session, please email community@hillview.kent.sch.uk to arrange a suitable date. Our Drama classes are taught by industry professionals and offer students the opportunity to develop their acting skills and explore the work of the actor. Classes are creative, innovative and designed for all ages and abilities. Students will learn acting technique, performance skills and presentation and appreciation of literature. Practical exercises to extend students’ imagination; including character building, improvisation, dramatic text and comedy. Expressive exercises, allowing students to learn how to be aware of their body movements, how to move on stage and dance. Technique exercises to improve voice production; including control of the voice, quality, accents, diction and singing. Our lively dance classes offer students the opportunity to learn a variety of dance styles with qualified, experienced professional teachers. A foundation for all styles of dance. Develops technique, strength, creativity and artistry and musicality. Vintage dance styles; including Jazz, The Charleston, Jive & The Lindy Hop. Expressive & Creative dance technique. Involving a variety of popular styles; including commercial and hip hop. Performance that combines dance, drama and singing. Students will learn how to combine songs, spoken dialogue, music and dance; whilst working on a current West End musical. Example musicals; Hairspray, Matilda, Wicked, Bugsy Malone, Legally Blonde, Mary Poppins. Students will also be given the opportunity to work alongside Drama to create a showcase, held in Hillview’s very own theatre.